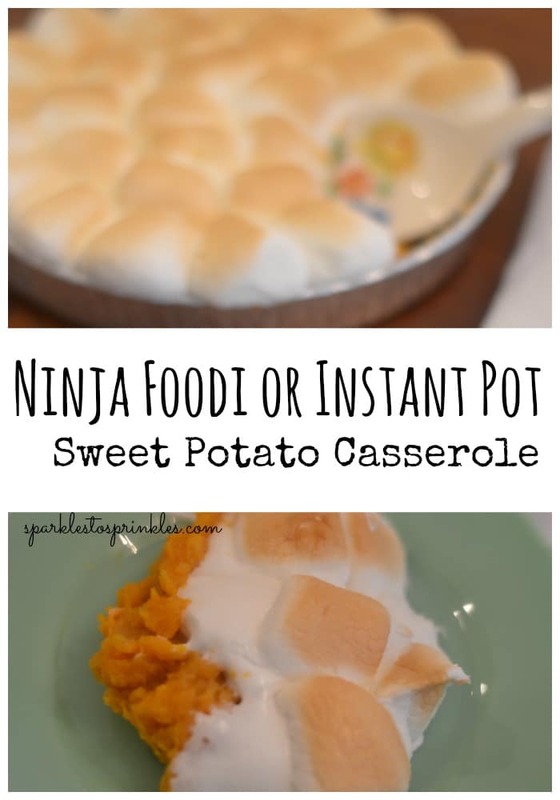 Ninja Foodi or Instant Pot Sweet Potato Casserole is going to be your winning side dish this week. The perfect side dish to pair anytime, don’t box it into the holiday season. 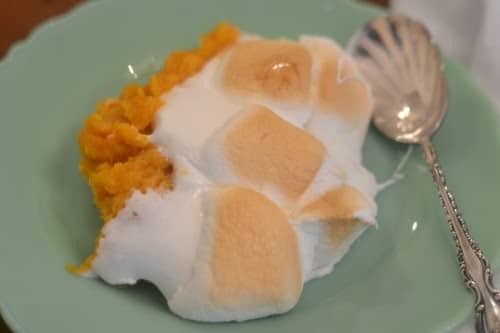 Creamy and tender sweet potatoes topped with brown sugar and marshmallows. No matter when you make this sweet potato casserole, it is sure to be a treat. I love to pair this with the most delicious Ninja Foodi Rotisserie Chicken. Add a salad and you have a complete meal done in no time. It is something different than a classic side of green beans or a can of corn. It helps keep my family interested in eating the meals I put before them. Plus who doesn’t love a sweet potato casserole? The reason I reach for my Ninja Foodi or Instant Pot is a multitude of reasons. One, the process is easy, and there is less cleanup in the end. Two, it saves room on the stove for other items I am cooking. And lastly, it doesn’t heat my house up the way the oven would. I also want to add the cook time is less than the traditional baking, so add that to the list. The Ninja Foodi has the Instant Pot features so it works just like the Instant Pot. You could even transition over to the crisping lid to toast up the marshmallows on top until they are golden brown. I love when they have a slight crunch when you bite into them! Your whole house will smell outstanding once you serve this up. Best of all the leftovers taste great reheated, and you can pair with other meals during the week like ham or even a chicken dish. Sweet potatoes are loaded with nutrients. They have been known to help with blood sugar, offer immune-boosting benefits, fight off disease, and they are loaded with vitamins and minerals. That is why many call these orange beauties a superfood that should be added to your diet when you can. The skins of sweet potatoes are edible, and you can leave them on if you like. For a sweet potato casserole, I peel them so you have a creamy texture. If you don’t peel your potatoes, it will give you a fibrous texture throughout your casserole which might not taste the best. Give my recipe a try whether it be in your Ninja Foodi or Instant Pot. Save space on that stove and skip the extra steps and use your pot instead. I think you all will really enjoy this side dish. Place your sling in the bottom of your pot before laying your pie tin in. There is no need to wash your pot until you are finished broiling your marshmallows. A perfect side dish for any holiday or weeknight meal. Creamy sweet potato casserole is the highlight of your dinner. Place potatoes in pot with 1 cup of water. Close the pressure cooking lid, make sure it’s in the sealing position and turn toggle to seal. Press Pressure (it should automatically set to HIGH pressure). Set time to 8 minutes. Hit START. When finished do a quick release. Drain the sweet potatoes and place in a bowl. Stir in the brown sugar, butter, vanilla and cinnamon , mash with your fork until smooth. Pour mashed sweet potato mixture into a 9" pie tin. Cover the top with marshmallows. 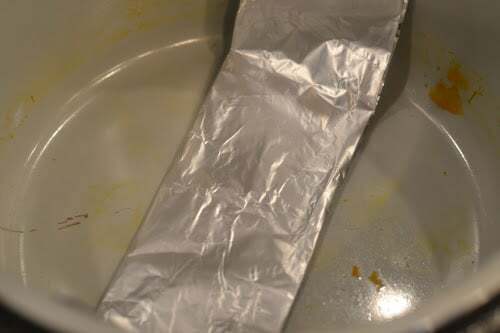 Create a sling using aluminum foil to make it easier to remove your pie tin once cooked. Place your sling in the bottom of your cooking pot. Lay your pie tin on top of the sling. Mine took 6 minutes to brown perfectly. Place in the oven on broil until your marshmallows are perfectly browned.